An outstanding English Maple (Acer campestre), the most hardy of maples with wonderful leaf shape and striking spring and autumn foliage colour. A very well proportioned bonsai with lush canopy and fabulous taper. 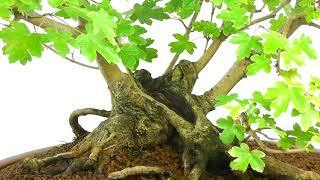 As a bonsai it has the most superb character, emphasised by its powerful stature and striking root flare. This gracefully flows to its two main trunks, beautifully hollowed between, which support a wonderful open spreading canopy. This Maple is grounded in a terracota-red pot, engraved on one side with Japanese lettering. A bonsai that is often highly under-rater, the English Maple is, in fact, stunning and easy to care for. It is a fine native tree, that becomes embelished with small green flowers and typical winged maple fruits as it matures. This is a very sturdy, powerful example of English maple bonsai. Beautiful multi-trunk tree which exudes character and detail. Beautiful canopy and wonderful seasonal leaf colours. The branches are beautifully positioned with great proportions throughout. Great British bonsai tree. Lovely. For more specific images please see the video below the main image.